Unless you bring your own from home, lunch options during the work week can seem limited to boring deli sandwiches or greasy fast food that will sap your energy long before 5 p.m. But if you work in the greater downtown San Diego area and you’re looking for something a bit more interesting and healthy to eat during your midday break, check out Puerto La Boca in Little Italy. If you want to keep it light and healthy, you can’t go wrong with the Ensalada Mixta La Boca. Mixed greens mingle with walnuts, baby mandarins, figs and Roquefort cheese, and for a protein boost, you can add grilled chicken breast, grilled skirt steak, grilled salmon or shrimp for an additional charge. Filet mignon isn’t just for dinner. Our Lomito sandwich features the mouthwatering cut of steak served on a fresh crusty baguette, with a light accompaniment of lettuce, tomato and mayonnaise. For a spicier option, you can go with the Choripan sandwich, made with delicious Argentinian chorizo sausage and also served on a baguette. All sandwich options come with fries “a la provenzal” (garlic and parsley), but you’re also welcome to substitute for salad. Fuel up for the afternoon with Puerto La Boca’s pasta specials, such as the creamy Fettuccini Cuatro Quesos featuring a sauce made with Roquefort, smoked mozzarella, parmesan and Reggiano cheeses. You can also add grilled chicken, steak, salmon or shrimp to any pasta dish if you need something heartier. Puerto La Boca is well known for its steaks, grilled to perfection in an Argentinian style. And while it’s hard to choose a favorite, the Entraña, our signature skirt steak, is the most popular. This special cut has just enough marbling to make it flavorful, juicy and tender. And complemented with our traditional homemade Chimichurri sauce, it can’t get any better. A Milanesa is a popular, authentic Argentinian meal of breaded, thin-cut chicken breast or beef served a variety of ways. If you haven’t tried it before, we recommend diving right into the Milanesa “A Caballo,” which features two fried eggs on top of the meat, and served with fries “a la provenzal” or homemade mashed potatoes. 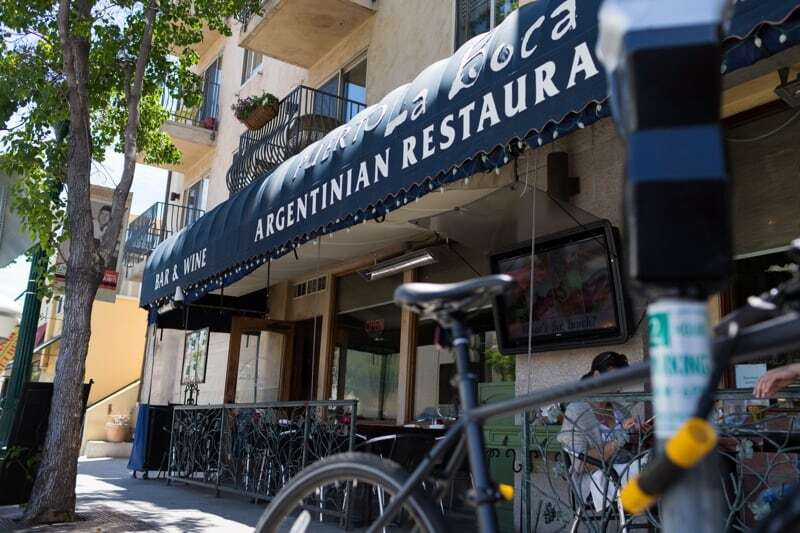 Bring a friend to lunch and share one of Puerto La Boca’s appetizing starters such as traditional Argentinian Empanadas, fresh basket of bread with homemade chimichurri sauce, olives & butter, or Provoleta, which is grilled provolone cheese with a slice of tomato, olive oil, and oregano. And if you still have room at the end of the meal, you can’t pass up one of the delectable dessert options, like Panqueques Con Dulce De Leche (flambe homemade crepes filled with Argentinian caramel) or Peras Con Salsa De Oporto (poached pears in a light Argentinian Port Wine sauce, served with vanilla ice cream). If you’re looking for a light lunch in San Diego or something more interesting than last night’s leftovers or a drive-through burger, Puerto La Boca awaits. Whether you choose a healthy salad or filling steak, you’ll leave satisfied and fueled for the rest of the workday. Check out our full lunch menu here and stop by soon! For special events and occasions, be sure to reserve a table in advance. We also offer a private, 14 seat room for work outings and lunch meetings. Give us a call at (619) 234-4900 for more information.